Hello and Welcome to the final day of previews and the January release for Sparkle Creations Rubber Stamps! Sparkle is releasing 2 new images -- they are available in the store now.. Today we are previewing the final image, Celebrating Chloe! I paired Chloe with some My Mind's Eye Fine and Dandy Tickled Pink paper. She definitely looks like she's ready to party, doesn't she?! Be sure to visit her and the rest of the SCRS designers for more peeks of Celebrating Chloe. Sparkle will be giving away a Celebrating Chloe to one lucky person! For a chance to win, you need to comment on all of the designer's blogs (list below). Then head on over to the SCRS blog and comment on the Chloe post. You have until midnight EST each day to comment. The lucky winner will be announced the following day! Also, this release marks the 6 month anniversary for Sparkle Creations (congrats Sparkle and Brent)! To celebrate, Sparkle will be having a sale in the store, 20% off everything from the release through the 22nd. The discount code will be CELEBRATE. I hope you have a wonderful weekend! Thanks so much for stopping by! 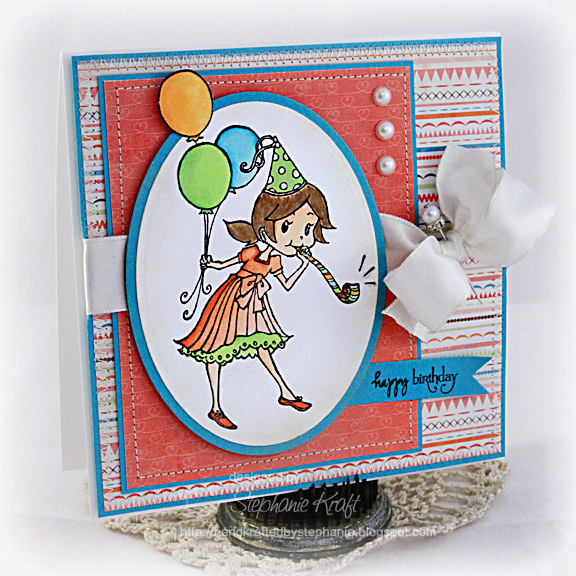 Accessories: Petite Oval Nestabilities (Spellbinders), Double-Ended Banners die (Papertrey Ink), Markers (Copic), Ribbon, Stick pin (Jenni Bowlin), Pearls (Queen & Co), Foam tape, Thread, Sewing machine. Oh so lovely! This is beautifully colored and I can almost envision her dress moving with the shading - fabulous! TFS! WOWEEE!! Love how Chole is ROCKIN' the orange. Love the colors and the layout. ::cute:: love chloe teamed up with the mme...soooo sweet! Beautiful card. I really like using my nestabilities and cropping around images. Really makes a card stand out! Too too cute! I love her rainbow party horn! another great card!!! love the colors...can't wait to get my hands on this image! Such a cute card. Love the use of the larger ribbon and the pearls. Love your Chloe card Stephanie! Did you say sale - really I think |I should go shopping! The papers you have used are so... nice - wonderful colouring too! So girly!! The stick pin, satin ribbon and pearls perfect match to compliment the papers!! Adorable card! Birthday Chloe is so sweet!